Did you know, John Cardoza, CAI, BAS, CES, has been doing Benefit Auctions (also called fund-raising and/or charity auctions) since 1984. John Cardoza is certified by the National Auctioneer Association as a Benefit Auctioneer and attended the charter class for this certification. Send people out in groups of at least 2, it's harder for a donor to say no to more than one person. Another advantage to sending more than one person is the volunteers trying to get the goods have someone to talk with if they are turned down. 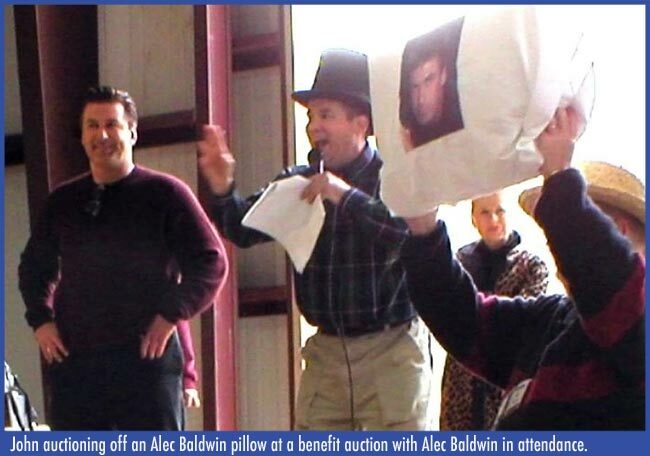 Be sure to tell the person you are soliciting that your fund-raising auction will have a professional auctioneer doing the auction and give them the name of the auctioneer. This will let them know that their items will be getting top dollar and if they know the auctioneer, they may even come or donate more to your event. Tell your donor what percentage of the money actually goes to the organization you are trying to help. If they know the majority is actually getting to the end organization, they will donate more. If your goal is to raise $1000.00, you need either 100 $10.00 items or 10 $100.00 items. Try for the 10, accept the 100 items. Don't turn down anything unless it is harmful. You can always give the items away in a door prize or raffle if it's not worth selling. If the donor wants a minimum bid, politely refuse the item. Minimum bids can put a big damper on your sale. For everybody that donates, be sure someone writes them a thank-you card for their donation. It may lead to a lot larger donation for the next years fundraiser. Send the auctioneer the catalog ahead of time. Organize the catalogue numerically. Print as many pictures in as possible in the catalogue. People like to see pictures or drawings and it holds their attention better. List the names of all the people who helped with the fundraiser events in the catalogue. If possible, send a catalogue to the audience before the auction so you can remind and advertise your function again. Have a second catalogue available at the auction. Make descriptions of items in the catalogue as exciting as possible. Sell ads to boost profits. Get a local printer to donate or at least print the catalogue for cost. If the auction is scheduled to start after a dinner, put auction starts after dinner instead of 7 P.M. in the catalogue. Fundraisers often takes longer then expected and you don't need people getting upset because the auction is starting late. A lot of money may be raised by using the silent auction. Make sure the merchandise is attractively laid out on the table and the cutoff time is adequately seen. Have a person in charge of the silent auction to check on items and see how the bidding is going. Each item should have a minimum starting bid and minimum raising bid. One way to figure out the minimum bid is 20% of value and the minimum raising to 5% of value. For example, you have a picture worth $100.00 so the minimum starting bid is $20.00 and minimum raising of the bid is $5.00. If halfway through the time period that item does not show any bids, the auction monitor can lower the minimum bids. The silent auction monitor should conduct a live auction on the spot if the bidding is still going on when the time is called, allowing those persons present to bid. This will determine the winning bidder and help keep politics out of your event. After the time is called, each bid sheet should have the high bid and bidder number circled so nobody else will come along and raise the bid. These sheets should be with a copy so the top sheet can be taken to the cashier and the bottom sheet can stay with the items. The reason for the bottom sheet to stay with the items is for those who are concerned can go around and see what they had purchased. This way nobody has to take up mike noise and announce all those names and how much they paid for an item. If your organization wants to let people know who bought what for the recognition it draws, have the sheets posted on a wall or put across an overhead of some type. Most people get very tired of listening to all those names unless it's theirs. Several people have came up to me after an auction and said they were glad they didn't have to listen to unnecessary noise. The live auction is the main fundraiser of your event. You want to make sure people are having a great time and are spending what they can afford to help out your organization. You want your auction to run as professionally as possible. To make the auction run smoothly takes a lot of preparing. A person needs to be available to the auctioneer at all times. The auction should always start on time. If the auction will start when dinner is over, the catalog should say Auction following Dinner instead of 8:00 p.m. The reason being most people are time conscience and they sub-consciousiy get upset when things are late. Somebody known to the majority of the group and has a sense of humor should be Master of Ceremonies. This will personalize your event and make it more fun for everyone. This could be a Mayor, Police or Fire Chief, DJ, News or Weather Person, or anyone else who can keep a crowd interested and entertained. Have the live auction bid forms prepared ahead of time, and available for the clerks. Start the live auction on time. Remind the Master of Ceremonies ten minutes before the close of each silent auction booth to announce the pending closing's. Provide a slide show with at least one slide per live auction item. The slide should be a photograph rather than a written description of the item. Set up the cashiers in a well lit, spacious and secure area separate from the auction room. Arrange for free transportation for the inebriated. Provide delivery service of large auction purchases and have the auctioneer announce this service. Video tape the auction so next year you can show everybody what the auction looks, sounds and runs like. By video taping your event, you can critique your event a few days later when you have a chance to view it with an open mind. Call your auctioneer the week prior to the auction. Send auctioneer your catalog as soon as it becomes available. See that it arrives before he departs for the auction. Provide the auctioneer with a written list of all duplicate items and minimum bids. Provide the auctioneer with all addenda to the catalog. Attach post-it notes in the catalog to give the auctioneer additional information, ie., minimum bids, duplicates, changes. Do not write in the catalog, underline or highlight words. Have an electrician check to see if you have enough power to the building for the lights, the sound system, and the cashier's equipment. Provide a lighted podium on the auctioneer's platform. Have a superior sound system. If you have under 500 guests, place the auctioneer's platform against a long wall. Provide every guest and volunteer with a bidder number. Learn the enclosed "Critique Form". Have at least 4 merchandise handlers/"runners", available to bring live auction items to the auction platform at the moment of sale. Have replacements to relieve them. Distribute copies of the enclosed directions to their clerks, runners, spotters, lighting and sound technicians. Have at least on bid spotter for every 40 quests. Have replacements available for relief. Equip each spotter with a whistle or wand. Schedule a meeting between the auctioneer and the professional sound technician one hour before the live auction is scheduled to begin. Schedule a meeting to occur 45 minutes prior to the auction, with the auctioneer, bid spotters, runners, clerks, and any supervisors. Have a table, chairs, and a lamp placed next to the auction platform for the clerks. Your job is to locate bidders and get them to bid higher. A minimum of one spotter per four tables (if possible) should be working at all times. In the event it will be an extensive auction, relief replacements for breaks should be available. Wave your hand when you see a bid and point it in the general vicinity of your bidder. Hold your hand up till the auctioneer has recognized your bid and then drop it immediately. Raise it again only when you have a new high bid or bidder. Feel free to yell "yep" or "over here" when you get a bid. Walk over and stand right next to your bidder. If you have two bidders, stand by one and keep your eye on the second, always looking for another possible bidder. If your first bidder drops out, keep an eye on him, but walk over to your second bidder and stand by him. Do not lose sight of your bidder. The auctioneer may need your help to locate the buyer after he says "SOLD"! Watch and Listen to the auctioneer to determine if you have the high bidder. If you are not sure, then let the auctioneer know by using body language that says, "Am I the high Bidder?" Do not raise your hand again unless you have a new higher bid. Every time someone bids against your bidder, lean over and ask your bidder if he would like to bid again. Be a salesman and have fun with the bidders. Get them to bid one more time! Be polite, courteous, friendly, and SMILE! If you get a last minute bid, wave your hand and shout "Hey Auctioneer?" Get your bid in fast. Once he says "SOLD" he can not accept any more bids. Do not mislead your auctioneer. If you are not sure if a person is really bidding, ask him, "Sir, are you bidding'?" before notifying the auctioneer. As soon as an item is sold, ask the buyer to show the auctioneer his bid paddle one more time. Feel free to pick it up and show it yourself. You may also try to remember how much that item sold for in case the clerk or auctioneer doesn't remember. Your job is to register customers & take in and keep tally of the money raised from the fund raising event. When guests arrive, have them fill out a registration card. Verify address and phone number, and make sure all information is legible. This will be your mailing list for next year's fundraising event. Ask "How did you hear about our auction/fundraiser today?" Complete this information on back side of registration card. If they say "Newspaper", find out which one/name of paper, same if they said "Radio". Assign a Bidder number, and write on registration card. Please be extremely careful not to duplicate or fail to write down the number! If the event has pre-assigned seats, ask if they need any assistance to find their seats. Smile and make them feel like they are at the best show in town. Your job is to write down the price and buyer's paddle number for each live auction item sold. A minimum of two clerks should be working at all times. Relief replacements should be available for long auctions. Ask your Auction Coordinator for a copy of the catalogue, the addenda, adequate pens or pencils, and the billing sheets. The billing sheets should be filled out, if not then fill them out now. Each sheet needs a catalogue number and a brief description of an item, e.g., 41 G.E. Washer. Have extra blank billing sheets in case the auctioneer sells duplicates of an item or surprise items. Make sure that there is a table and chairs set up next to the auction platform and that there is sufficient lighting for you. The auctioneer will repeat each sale price and each buyer's number when he sells an item. Keep conversations to a minimum and remain alert. You never know when the auctioneer will say sold. When the auctioneer says "SOLD" please listen intently. One clerk should record the information on the official billing sheet while the other writes it in the catalogue. If either of you do not hear the information first ask your partner, if neither of you heard it, then immediately ask the auctioneer. It you are asked to give messages to the auctioneer, wait until he is between items to get his attention. Your Auction Coordinator should supply you with a couple of workers to run the completed billing sheets over to the cashier. Do not let completed billing sheets pile up. Your job is to carry the live auction items from the display area to the auction platform, and then to the storage area. You may also be used to run a clerking sheet to a buyer for them to sign immediately after purchasing an item. A minimum of four runners should be working. Your auction coordinator will have a copy of the catalogue and addenda. Every item must arrive at the auction platform on time and in the correct order. Any item that two people can easily carry without breaking should be brought to the platform. Do not bring gift certificates or signs so small that they would be unreadable from where the audience is watching. Have at least two items waiting at the foot of the auction platform at all times. Wait until the auctioneer calls for an item before you carry it onto the platform or in front of the audience. No more than two runners should be on the platform at one time. Walk the item around the platform so that the entire audience will have a chance to see it. Be careful' Do not trip on the stairs or the microphone chord. Remember, the auctioneer is looking for bidders so watch his movement so that you do not collide. Remain on the platform until the auctioneer has sold the item. Please, no talking while on the auction platform. When the item is sold, take it to the live auction storage area designated by your Auction Coordinator. Pick up another unsold item and get in line to do it all over again. If you are running clerking sheets, now is when you would go to the buyer, have him or her sign the sheet, and then take to the cashier so she can start the check-out process.